VMware Inc. CTO Steve Herrod (above) dropped hints about what’s to come from VMware’s vSphere and VMware Desktop Infrastructure (VDI) products in a keynote that opened VMworld’s Wednesday sessions. VMware is working with storage vendors to put virtual desktop root disks into high-speed cache on storage arrays for faster boot-up times. Based on a new OEM relationship with RTO Software announced today, virtual desktops can be given individual personalities while their operating systems are managed centrally. This will simplify patching, since each virtual desktop OS doesn’t need to be separately patched, while saving storage space by using a “golden” OS copy. Without the ability to have patches proliferate from the golden copy (which is the case when using space-efficient snapshot environments within storage arrays), users face a choice between patching each copy, potentially exploding storage capacity requirements, or redeploying virtual desktops. 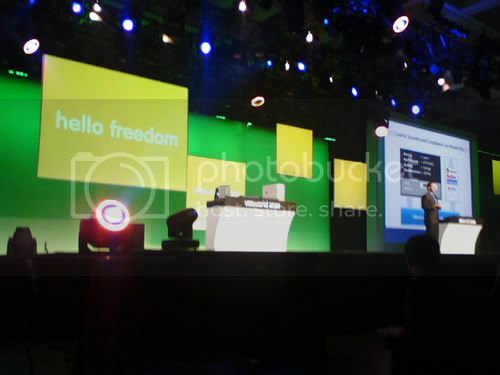 VMware and Visa demonstrated mobile device virtualization during the keynote. VMware is developing products that can let mobile devices run applications with data centralized at the corporate data center rather than residing on each endpoint device. VMware’s Distributed Resource Scheduler, which today VMotions virtual machines between physical servers based on power consumption and processing load, will also take into account disk and network I/O. “DRS will combine with tiering algorithms on the storage side to match the application with hardware,” Herrod said. Similarly, VMware’s vApp, which encapsulates multi-tier applications with policy information, will include disaster recovery recovery time objective (RTO) information as well as availability requirements in policy profiles. Another topic getting a lot of buzz at the show this year is distance VMotion–stay tuned for more on that front.